The voice may not have been his, but the band carried his name, and with it his own fun-loving musical style. 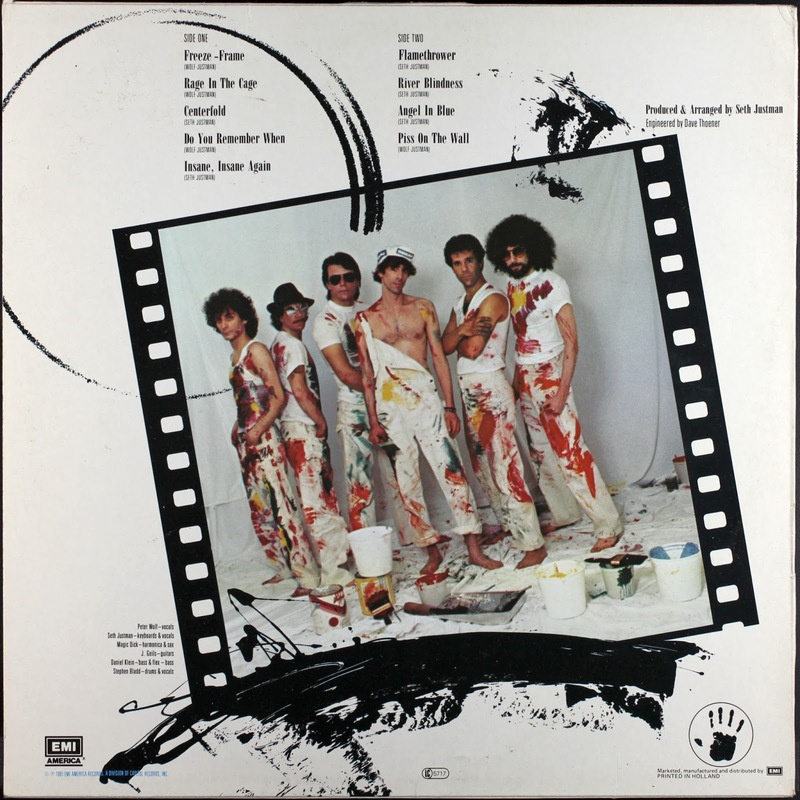 The J. Geils Band had a string of toe-tapping ditties in the early 1980s, sung by Peter Wolf, but accompanied by J. Geils. The "J" stood for John and, sadly, he passed away earlier this year. Immediately, the memories of those catchy tunes came back, and a connection I made with one song in particular. It was the second semester of Grade 11, making it the spring of 1986, when I started working on my very own teen angst story. Initially, it was a screenplay that I turned into a stage play. It was a contemporary story chronicling a teenage boy’s experience, and bad luck, with girls. I really wanted to incorporate a lot of music, a la the John Hughes teen angst movies of the time. One night, I had the radio on and was listening with my head phones when this song I had never heard was wrapping up. The deejay came on and said, “That was ‘Love Stinks’”. I immediately thought that would be a great song for the sound track, because it captured the sentiment of the main character of my story. Soon after, I discovered the song was by the J. Geils Band. Probably, a month after that, I heard a preview on LA-107 FM for a super session featuring the J. Geils Band at 7 p.m. that night. I made sure to be at the ghetto blaster a few minutes before 7 p.m., with a blank tape loaded, ready to hit record. Fittingly, the first song was “Love Stinks” and I was able to capture the whole thing. A few months later, once I had finished the play, I set to creating the sound track. The song leading everything off on Side A was “Love Stinks”. Thus was my introduction to the J. Geils Band. That super session also introduced me to the other mainstays in the J. Geils Band collection: "Freeze Frame" and "Centrefold". The opening bars of “Freeze Frame” along with the band yelling “Freeze Frame” make it a memorable song. The second I heard that, I thought, “Oh, I have heard this before.” Of course I had, because it had been a hit on the radio. The same went for “Centrefold” which was another memorable song with a distinctive sound. As I would learn in one of Casey Kasem’s countdown radio shows, “Centrefold” was one of the few top 40 songs that had whistling in it. That in itself is something I will never forget. 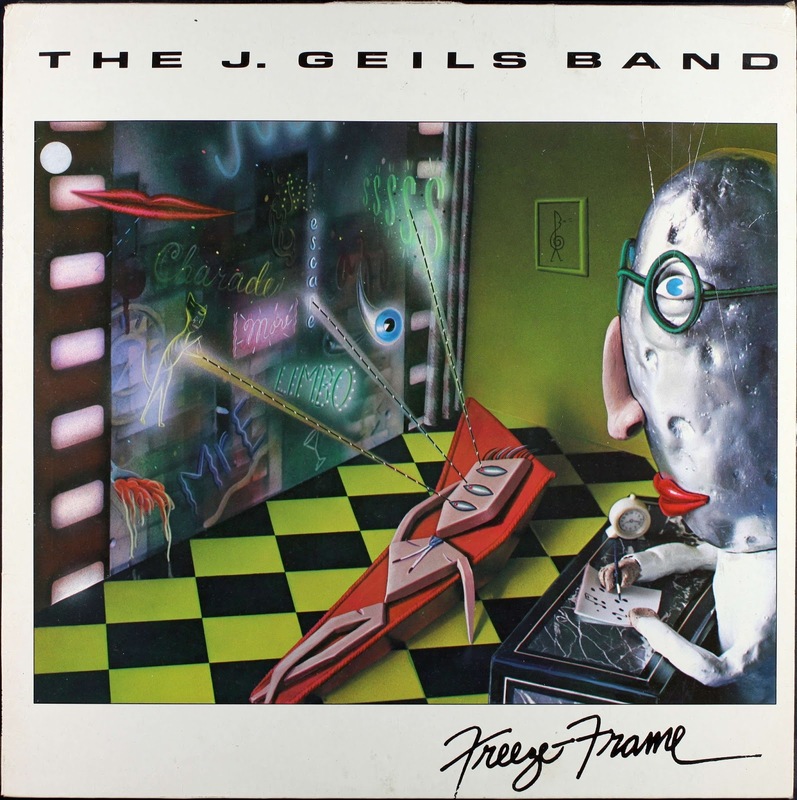 The front of the J. Geils Band album "Freeze Frame"
“Love Stinks” reached number 38 in 1980 on the Billboard Hot 100, while “Freeze Frame” went to number four in 1981; and “Centrefold” went all the way to the top in early 1982. Periodically, me and my parents would go visit my brother in Calgary on a Saturday, and stay over until Sunday. One of the things we started to do was go to this massive flea market held in an old super market building. My brother loved to look for old records, something I did too. One particular Saturday, I hit pay dirt. There was a treasure trove of records that were in remarkably good shape, selling for a dollar apiece. The back of the J. Geils Band album "Freeze Frame"
One of the first ones I saw, was “Freeze Frame” by the J. Geils Band. I was instantly struck by the art work. On one side is this really wild surreal painting, and on the other side the band members were splattered with paint, as if they had just survived a paint fight. They seemed to be having fun, which was the same feeling I got from all their music. At the start of Grade 12, I heard this song on the radio that caught my attention. It was “Come as You Are” by Peter Wolf. It would go all the way to number 15 on the Hot 100. 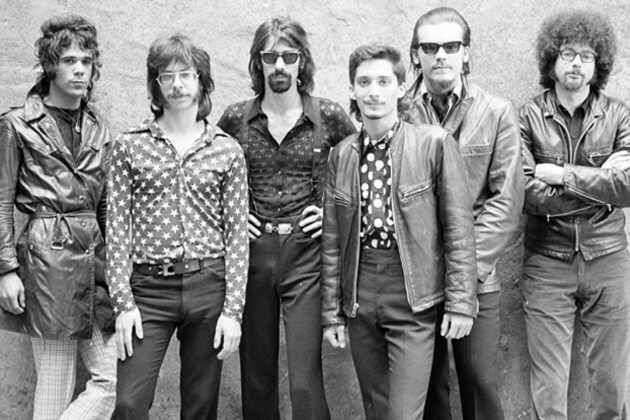 It was another top 40 show, on AM 106 maybe, that I learned Peter Wolf had been the lead singer of the J. Geils band. I knew that voice sounded familiar. He had already had some solo success, with a single called, “Lights Out” that came out in 1984 and went all the way to number 12. Wolf had left the group in 1983. They would record one more album in 1985 then break up. There are songs that are not just the soundtrack of the times, but also the soundtrack of life at that time. “Love Stinks” was a part of the soundtrack of my life when I was in the last half of high school. “You love her, and she loves him, and he loves somebody, you just can’t win,” they sang. That was the story of my life especially in Grade 11. That was the way I was feeling, especially about one girl in particular who I liked, but she liked somebody else. It was a song that resonated. It was like J. Geils was talking through the radio right to me. Then I discovered their other songs. Sometimes in life, you come across songs that you can’t help but sing along too. “Centrefold” is just one of those songs. In this case, I can’t help but whistle along to it as well. “Freeze Frame”, was catchy in its own way. Even Peter Wolf’s solo stuff had a catchy style. Added all together, J.Geils was not just a part of the ‘80s, but holds a special place in my heart.